After a long career in major league baseball, one mired in scandal over steroid use, it might be fair to say that Jose Canseco isn't afraid to risk his reputation from time to time. When it comes to cruising around with goats in his car, however, the former slugger isn't taking any chances. 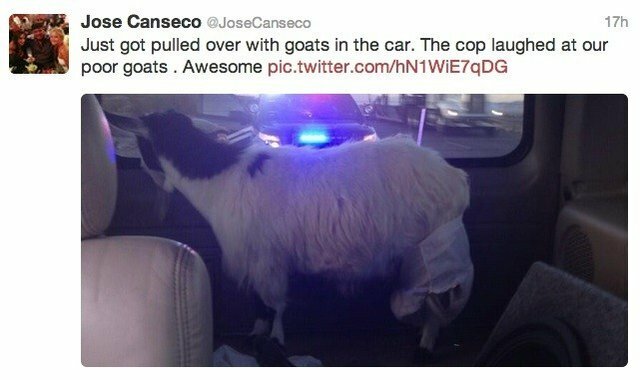 According to Canseco's twitter feed, he and girlfriend Leila are now the proud to owners of two pet goats. He writes that the animals will be their "children" until they have real babies -- but diaper duty has already begun. He was worried they would sully his upholstery. Drive cautiously when transporting goats to reduce the chance goats will fall. Braking and cornering cause 75% of falls; crossing bumps and accelerating account for 25% of falls. Accelerate slowly and smoothly.Plan your braking and slow down gradually.Drive slowly when going around corners or crossing bumps. Plan your braking and slow down gradually. Drive slowly when going around corners or crossing bumps.